Here is the project I learned to single stitch crochet on. It is definitely not perfect but it is done. 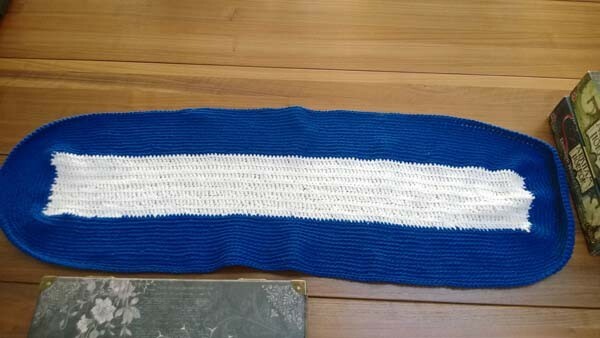 The white part was created by me, my mom, and my sister-in-law as they taught me how to crochet. The blue part was all me. Clearly, I need to learn how to do a few things... like going around corners. But! It's done. And folded in half, it fits perfectly in Leeloo's bed. On to the next cat blanket. I'm officially hooked. Crochet is fun. I found it more satisfying than knitting, not sure why. It seems more forgiving maybe. You'll be surprised how quickly you get good enough to start doing new things. I did a little crochet in my early twenties, but never got much past single and double crochet. Then I needed curly hair for a doll this summer, and ended up breaking out the crochet hook and figuring something out. A couple months and a couple random hats later I crocheted a 'chain mail' helm for Nenya's Halloween costume this year, by just futzing around figuring out what looked good (that crochet is forgiving thing really helps with freeform experimentation). Watch out or you'll be making your cats hats. Right now, I think I'll just stick with cat blankets for my cats and to donate to vets / rescue operations. And yes, crocheting is very forgiving. Michaels has free patterns hanging up in the yarn area if you are every wanting to try some out, and so does Fredmyers. Also, if you ever get stuck, let me know, I can help. Will do. I'm looking at a lot of youtube videos on crocheting, too.